She’s spent one summer at Google’s computer science program at M.I.T. ; another at University of California, Berkeley; three weeks at an engineering program in South Africa; and most recently, five days at the Grace Hopper Celebration of Women in Computing. 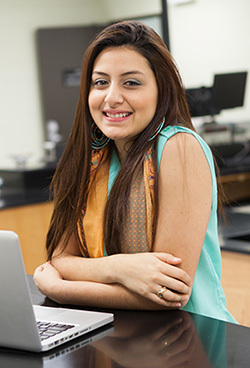 At nineteen years old, Angelica Gallegos (BS ’17) seems poised for a bright future. Her achievements have come through perseverance and hard work fueled by heartache. When Angelica was twelve years old, she lost her mother to brain cancer after years of sickness. Her parents, both from Mexico, left grammar school to begin working to support their families. “They simply didn’t understand how to value education,” she said. Determined to get an education herself, Angelica applied in eighth grade to the Illinois Mathematics and Science Academy, an accelerated high school. She got in, becoming part of the 6 percent Hispanic demographic. From there, Angelica pushed herself to take on as many opportunities as possible through programs like Leadership Education and Development, (LEAD). Angelica recognizes that part of her success has come by her willingness to explore. “I’ve figured out that a huge reason young women are discouraged to join the field is because of the misconceptions they hear like girls aren’t good at math,” she said. Recently crowned Miss Fiestas Patrias from the Mexican Cultural Center of DuPage, Angelica decided to compete in the pageant to serve as a role model for young women in the computer science field. She's also won a full scholarship to UIC as a member of the Honors College and is this year’s recipient of the College of Engineering’s Jose A. DeLeon Scholarship and an Access Illinois Scholarship, which help her cover costs for books and other fees. “My biggest non-academic goal going into college was not to ask my dad for any money,” said Angelica. She’s thankful that financial aid has allowed her to concentrate completely on her studies, participate in professional organizations, and stay involved as a mentor at the Mexican Cultural Center of DuPage where she encourages younger kids to stay in school and discover their dreams. As part of the new guaranteed paid internship program, Angelica is one of many engineering freshmen at UIC who will begin building r�sum�s at the start of their college careers. She recently accepted a summer internship offer at Cisco Systems in North Carolina as an IT Analyst.